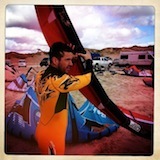 Bay Area Kiteboarding • View topic - Don't Kite Stagnant! Keep the Progression Going! Don't Kite Stagnant! Keep the Progression Going! Re: Don't Kite Stagnant! Keep the Progression Going! 2010 I was riding strapped and blowing 75% of my jibes. 2011 strapless 100% of the time no matter how big and added a ton of backhand to my rights. Raceboard width grew by about 25cm and my fins by even 5cm more than that. It will be great to see what success 2012 will bring us all - I know everybody will have an awesome year... Happy New Year! True dat, Ramsey, it WAS a bad year, for wind AND waves around here. I thought I hadn't made much progress in 2011 until last month when I headed to Maui and hit two different expert-only spots during a XXL swell with a group of locals who told me that "no one kites strapless in Maui in these conditions". I never put my straps on, although if I had had a leash on at one spot it would have saved my board from going up on the rocks. Great post. Interesting to see the varying levels of ability. 1st season for me and got boosting and my backroll (hooked) pretty much dialed in thanks to ramsey! I hope to spend more time with him in the water in 2012 and I'm super motivated to start wake-style tricks unhooked with him! And needless to say I'm gonna try as hard as I can since we're not supposed to survive passed december 21st! Attaboy Paul. If I had been there, I totally would have been on the beach being like "oh yeah. I know that guy." and then I would have found some flatwater to go kiting on instead. that said, I realized that overhead waves DO have an appeal for me. I landed my first Frontside 5 in Cape Verde in pretty big swell. Freestyle in waves is fun! Strapless surfboards in the waves is soooo last year. Next year, land some 5s at 3rd and it's probably time to graduate to a blindjudge3. a backmobe would be cool too. I've shortened the time it takes to rig and de-rig by 20% last year. So as far as new stuff, I've finally got those flat 3's about 20-50% depending on the session, and I did land one OHH-blind. In the surf, my SUPing skills have definitely increased for what its worth...."rode" an overhead wave unhooked, and got the tacks pretty well dialed in both directions. So, still a little progression for me. What have you guys got????? go under the GG bridge. Did both, definitely more successful with the first one, but at least for the second, it prepared me for next season where I'm planning on spending a LOT more time at the lower launch at 3rd. As far as the ocean goes, did so much training at OB this season that the day I went to waddell on over-head surf I had no problem or whatsoever to get out of the surf. That felt pretty good. Rided a bunch of new spots (Crissy, Stinson, Flying tiger, Pismo, Marina bay, HMB harbor,...) and met a bunch of really good people. So overall, 2012 was a success, even if I wish I spent more time on tricks and less in the ocean. So beware 2013, I'm gonna pass that bar!